George Miller’s iconic series goes open world. Get all the lovely details here. What a game. What a lovely game! Just Cause developer Avalanche Studios has been hard at work making the first proper Mad Max game since the NES era. While the series hasn’t appeared much outside of the silver screen, Avalanche and publisher WB Games have stated they want to bring the Wasteland to life and fully delve into the world of the film. Avalanche has said that their game will contain elements from the movies, but tells an original story of Max fighting against Scabrous Scrotus, the son of Immortan Joe from Mad Max: Fury Road. (There’s no word on whether it takes place before or after the events of that film, though.) Early footage of the game has showed promise, with a Batman: Arkham Asylum style battle system and a wide open wasteland to run around in. That potential is being utilized, because the game’s E3 demo shows some great gameplay and promising new mechanics. In the demo I played, I was given a mission to collect car parts to upgrade Max’s vehicle, the Magnum Opus. By scavenging the Wasteland for parts like rusted-out frames and roaring engines, you can customize your car on the fly, requiring nothing more than a trip to the pause menu to swap parts and purchase upgrades using the game’s currency: scrap. Scrap can be obtained in a number of ways, from defeating enemies to searching crates and destroying other cars. Speaking of that, I was fairly skeptical of vehicle combat going in, but Mad Max finally makes smashing into cars feel as good as it should. At any time, you can slam into other cars to deplete their health bars, or use weapons like shotguns and even a harpoon that’ll pull you closer to your opponent and rip them apart in the process. The real fun part, though, is adding spikes to the front of the Magnum Opus and ramming into other cars at top speed. Combat on foot in Mad Max isn’t too shabby either, with the familiar Arkham brawling system of chaining attacks, dodges and counters to form combos returns. While it’s clear where the combat’s influences lie, Avalanche has made Max a speedier fighter than the Caped Crusader, with his attacks hitting fast and hard and even building a super meter. When it’s full, Max goes into the deliciously-named “Fury Mode” and can wail on everything in sight. There’s also an array of weapons like wrenches lying around to keep things fresh. Gunplay is also present, but it’s more of a simple aiming system and nothing more. By the end of Avalanche’s demo, it was clear that the game would follow the familiar “liberate parts of the map from the bad guy” structure found in games like Shadow of Mordor, with the Wasteland controlled by bosses serving as the game’s big bads. And that seems to be the core experience of Mad Max: using familiar mechanics to make something new. While the game may have Batman and Mordor in its DNA, the way it uses those systems and puts its own spin suggests that it will have no trouble carving out a space in the open-world genre all its own. 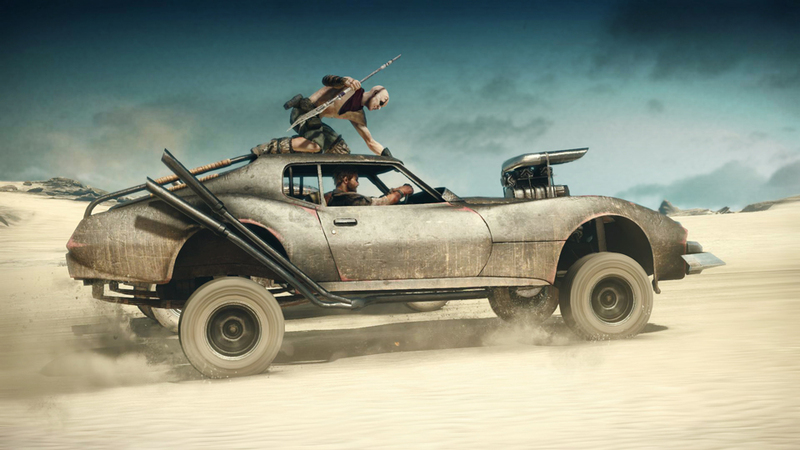 Is ‘Mad Max’ a good twist on open worlds or a simple rehash? Tweet me @MaxMielecki. And be sure to follow us @YouNerded.